by Chris Woodford. Last updated: October 30, 2018. If you could have only one vehicle in the entire world, what would you pick? Many of us would opt for an amazing sports car or even a race car. Some would go for a four-wheel drive or a pickup. Given the choice of absolutely any vehicle, I think I might go for a tractor. Armed with a powerful diesel engine and huge chunky tires, I could go anywhere and do anything! Tractors are truly amazing vehicles, but have you ever stopped to consider what makes them so great? Let's take a closer look! 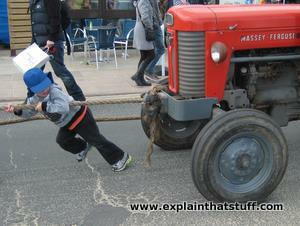 Photo: The first tractors were little more than replacements for farm animals: all they could do was pull things. Modern tractors can do much more because they have a power takeoff (the rotating power axle at the back) and front and rear hitches (the hydraulic lifts on the front and back). This John Deere is cutting a hedge in Staffordshire, England with the yellow implement attached to the back (a Shelbourne Reynolds Powerblade). If you've ever been stuck behind one in slow-moving traffic, you probably think a tractor is a nuisance—but that's hardly a definition! The word "tractor" is related to words like "traction" and "tractive," from the Latin word "tractus" meaning drawing (pulling): a tractor is essentially a machine designed to pull things along, usually very slowly and surely. Photo: Tractors are designed both for pulling heavy loads and powering implements attached to the back. This John Deere tractor is doing both at the same time: the tractor powers the machinery inside the hay baler it's pulling behind it. Tractors have large and powerful diesel engines and, in theory, that means they should be able to go incredibly fast, just like sports cars. But in a tractor, the engine's power is designed to be used in an entirely different way: for pulling big and heavy loads. What makes this possible is the tractor's gearbox, which converts the high-speed revolutions of the mighty diesel engine into much lower-speed revolutions of the wheels, increasing the force the tractor can use for pulling things at the same time. If you know anything about gears, you'll realize that a tractor's incredible pulling power must come at the expense of speed: if you ever see a tractor going really quickly, chances are it isn't dragging a heavy load. Likewise, if you're stuck behind a really grumbling tractor inching down the road, you'll know the engine is probably working as hard as it can pulling a load. Tractors were originally designed to replace working animals such as oxen and horses, which people have been using to pull carts and plows since ancient times. One of the pioneers of modern tractors, American industrialist Henry Ford, got at least part of his inspiration from a simple determination to come up with something better than the horse for doing heavy farm work. 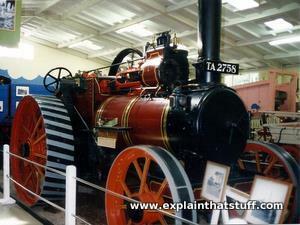 Photo: A steam traction engine similar to the one that inspired Henry Ford. You can see that it's essentially a big metal cylinder on wheels. The cylinder (colored red and gold) is where water is boiled to make steam. The wheels are made entirely out of metal, with spokes but no modern rubber tires. "I felt perfectly certain that horses, considering all the bother of attending them and the expense of feeding, did not earn their keep. The obvious thing to do was to design and build a steam engine that would be light enough to run an ordinary wagon or to pull a plow. I thought it more important first to develop the tractor. To lift farm drudgery off flesh and blood and lay it on steel and motors has been my most constant ambition." You can read more about Henry Ford in our article on the history of cars. Modern tractors are much more sophisticated than traction engines and they can do all kinds of things, thanks to some really useful features. Hauling heavy loads is still one of the most important jobs that a tractor does for a farmer. Tractors pull implements (farm machines such as plows, trailers, hay balers, manure spreaders, and so on) using a sturdy rod called a drawbar, which makes a secure but very flexible link between the tractor and whatever is following it. The drawbar can pivot so a tractor can easily pull its load around corners. Reversing is a bit more tricky! Photo: Farm machinery has been making light work of jobs like this since the early 18th century, when English farmer Jethro Tull (1674–1741) revolutionized agriculture by inventing the first mechanized seed drill. Modern plows, like the one being towed behind this Massey-Ferguson tractor, were invented about a century later by Illinois blacksmith John Deere (1804–1886). This plow is being lifted, raised, and dragged through the soil by a lifting system called a hydraulic hitch, which Massey-Ferguson originally pioneered. All a horse can really do is drag something behind it, which is a problem because implements often have to be moved from one field to another, sometimes by driving them down public roads. 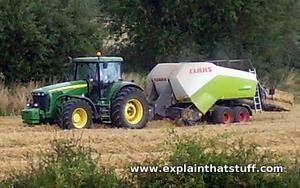 Modern tractors get around this using a hydraulically powered pulling and lifting system at the back, known as a hitch. The hitch makes it easy for a tractor to lower a plow when it is working on a field, and then raise it up again to drive it somewhere else—but that's not all it does. It can raise and lower implements off the ground with a flick of a switch, but it also keeps the tractor pulling effectively as the ground conditions change and give more resistance. It transfers some or all of an implement's weight to the back wheels of the tractor, giving it more grip against the ground. The mechanical design of the hitch keeps the whole tractor safe and stable and stops it flipping backward if the implement it's pulling suddenly snags in the ground. 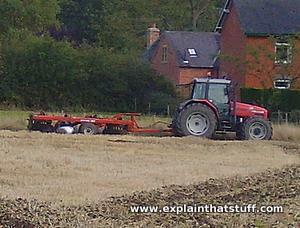 Most importantly of all, it allows one tractor to work with many different implements. All tractors use similar hitches, so virtually any implement will work with any make of tractor. Harry Ferguson, an Irish-born British tractor pioneer, popularized the modern hitch system, which is called a three-point hitch (or three-point linkage), in the 1940s, though it was largely developed by his engineer and mechanic, Willie Sands. The hitch made Ferguson rich and famous, partly because of a short-lived partnership with Henry Ford; today, Ferguson is best remembered as one of the founders of the Massey-Ferguson tractor company. 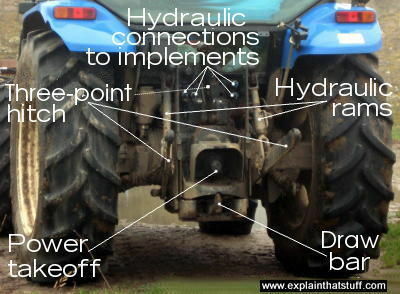 Photo: Rear view of a tractor. The hydraulic hitch is a lever mechanism that raises and lowers implements, powered by two hydraulic rams either side. You can also see the tow bar and the power takeoff just above it. At the top, there are hydraulic connections to power implements and electrical sockets that can be used to power things like brake lights on implements when they're being towed on the road. Early traction engines could be used to power harvesters, elevators, and other kinds of equipment by parking them, disengaging their driving wheels, and then transmitting their power to another machine. Typically, this was done by looping a long rubber belt over the spinning wheel on top of the traction engine so it passed over a similar wheel on the machine that needed to be driven. Power was carried between the machines in much the same way as a bicycle chain takes power from the pedals to the back wheel (only with a rubber belt instead of a metal chain). Virtually all modern tractors can power implements or machines using what's known as the power takeoff (PTO). It's a rotating shaft, usually at the back of a tractor, from which power can be taken from the tractor's engine. To use the power takeoff, you need to hook up a special spinning rod (with clever, flexible connections called universal joints) between the tractor and the implement. A machine like a hay baler has spinning rakes, wheels, and gears inside it. When it's hooked to the back of a tractor, it's connected to the power takeoff so the tractor's engine powers the machinery inside the bailer as well as driving its own wheels. That's why tractors pulling powered machinery have to drive relatively slowly: a fair bit of their engine power is being diverted to the equipment behind them. Look closely at a tractor working in a field and you can often see the power takeoff rod spinning between the tractor and whatever it's pulling. But never get close to one: they spin at about 500rpm and can be extremely dangerous. Photo: The yellow bar coming off the back of this John Deere tractor is the spinning power takeoff—one of the most dangerous parts of a tractor. 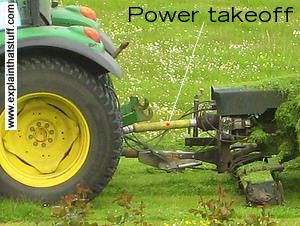 Beneath the power takeoff, the drawbar is what attaches the mower securely to the tractor. 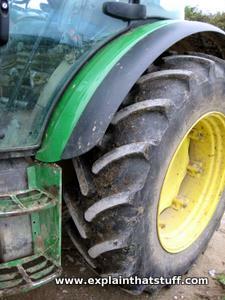 The most noticeable thing about a tractor are its giant wheels and tires. Large pneumatic (air-filled) tires spread the weight of the tractor over a larger area and deep treads give excellent grip. By reducing the pressure on the ground, the tires stop it from sinking in to soil and mud that would quickly bog down a conventional car. The more the tires spread the load, the less damage the tractor does to the soil it's driving over. Most tractors have two-wheel drive, with the large rear wheels driven from the engine and the small front wheels used only for steering. Since a tractor is usually pulling things, that's fine: the heavy weight behind it pushes the rear wheels down, increasing their grip, so there's no particular advantage in having powered front wheels as well. (Four-wheel drive tractors are also less common because they're more complex and expensive.) Some tractors have extremely wide, multiple wheels and tires for negotiating particularly soft or difficult terrain; for obvious reasons, you won't see those on the roads! Photo: Tractor tires are bigger and chunkier than car tires and often tubeless (without separate inner tubes, like the ones in bicycle tires). That doesn't mean they're solid lumps of rubber! It means the air fills up the entire space between the tire and the wheel rim. Some tractors use what are called floatation tires (extra-wide tires that spread the load and sink less). Others have "dual wheels" and tires (four wheels and four tires at the back and sometimes four at the front as well). This gives extra pulling power, better floatation, and more grip on boggy ground. Tractors are generally powered by large diesel engines, which are particularly good at providing high pulling power at very low speeds (that's why they're used in trucks and buses). Smaller tractors may have gasoline engines and some are powered by LPG (liquified petroleum gas), usually to make them more economical or environmentally friendly. 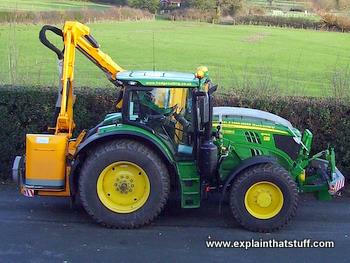 Photo: Another John Deere tractor, this time with a more environmentally friendly LPG propane engine. Photo by Jerry Hymer courtesy of US Department of Energy/National Renewable Energy Laboratory (DOE/NREL). Driving a tractor might look easy—the engine is doing most of the work!—but it needs a great deal of skill. Power-assisted steering and braking are essential to help tractor drivers keep heavy loads safely under control. Since tractors are heavy and often have to work on steep slopes and soggy, unstable ground, there's always a risk they might tip over so modern tractors generally have reinforced cabs fitted with anti-roll bars. Although tractors could never be described as luxurious, most now have heated cabs, some have air conditioning, and a few are fitted with GPS satellite navigation (sat nav) to help farmers plan how they work their fields with military precision. It's all a far cry from working your fields with a horse and cart! Kids, stay safe on the farm! Farms look fun, but they're very dangerous places—workplaces, not playgrounds. If you want to look at tractors and other farm machines, ask a farmer to give you a tour or try visiting an open farm where proper supervised tours are arranged. Don't monkey around on farms by yourself! Once Upon a Farm... A Safety Video for Students: A group of children discover the dangers lurking around a farm. From Ireland's Health and Safety Authority. Keeping Kids Safe on the Farmfrom Kidsafe WA. Farm safety: children: A guide to help parents teach children about farm safety from the Australian government. Farm safe: From the UK's Health and Safety Executive. Total Tractor! by Josephine Roberts. Dorling Kindersley, 2015. An absorbing 144-page guide for ages 7–10. A highly photographic book covering tractors and traction engines through the ages, with short information boxes and plenty of facts and figures so you can compare different models. John Deere: Big Book of Tractors by Heather Alexander. Dorling Kindersley, 2007. Ages 7–10. DK Eyewitness: Farm by Ned Halley. Dorling Kindersley, 2000. A great introduction to the science and technology of farming, including everything from the early history of agriculture to modern genetic engineering. Ages 9–12. Big Book of John Deere Tractors by Don MacMillan. Voyageur Press, 2005. A comprehensive encyclopedia covering all the models John Deere has produced over the years. Legendary Farm Tractors: A Photographic History by Andrew Morland. Voyageur Press, 2003. A coffee-table book for tractor lovers!